I’m among a few staffers that Automattic sent to the MLA conference this week with the mission of trying to identify how WordPress is being used in the academy and how we might find ways to address the particular needs of that segment of users, which I take to be composed mostly of professors and graduate students with some publishers mixed in. I attended a session today about using two tools — Omeka and WordPress — for student-generated projects. After a bit of introduction about the general premise, the attendees broke into groups interested in one or the other piece of software for a more focused introduction to each. Naturally, I went with the WordPress crowd. Fitting a solid introduction into a 20ish-minute breakout session proved somewhat ambitious, so I thought I’d put together a little guide to help point interested folk who couldn’t make the session or who may have had trouble absorbing it all in the right direction. Start at WordPress.com. Just create an account if you don’t already have one, and choose the “free blog” option. If you decide you like the service and want to buy a domain or other goodies for it later, you’ll have the chance. But for now, just dip your toe in with a free blog. Once you have the blog set up, you can play around with customizing the theme (how the site looks) and writing your first post. Don’t worry if your first post isn’t a dazzling piece of scholarship. Just post something to get a feel for how it works. If you’re terribly nervous about having an unfinished site in public view, you can set your blog to be private (something you may want to do ultimately anyway to keep student data private). Now that you’ve tinkered with the blog a little, maybe you’d like to turn it into something more like a site your students might actually find useful. First, think about what pages the site should have. For example, you might want a statement of purpose for the course, a page with information about office hours, a syllabus page, and a page detailing class rules. To add these, just go to the Pages item in your new blog dashboard and add a new one. You should generally think of pages as static content, things that will appear in site menus and contain information that’s updated rarely. We’ll get to more frequently updated content later. Some themes will automatically add pages to the menus at the top of your site. Some won’t, and in any case, you may find that you want to exert more control over how they’re organized. You can do this from the Menus item under Appearance in your dashboard. The interface for this is fairly powerful but also a little unintuitive. You first create a menu by adding some combination of pages, category listings, and external links to a menu group. Once you’ve saved the menu group, you set it as the primary menu for your site. 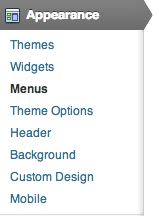 Don’t be deceived by the tabs displayed in the interface to distinguish between the menu groups. Each of these represents a menu with its top-level and sub-items and not the top-level item itself. That is, you can define multiple menus composed of top-level and sub-items but set only one as the primary menu (some themes allow you to set both primary and secondary menus). There’s a handy dandy tutorial (with video) available here. It can sometimes be useful to build hierarchy into your page structure. For example, you may wish to have an Assignments page that links to the honor code and explains general expectations and to have as sub-pages a page for each of the major course assignments. 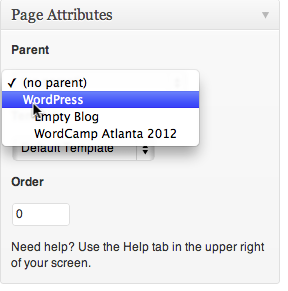 To do so, first create what will be considered the “parent” page. Then, when creating what will be its “child” pages, specify the parent in the Page Attributes section of the page editor. As noted above, in many themes, setting this parent-child relationship will automatically cause your site menus to become menus that display the child pages as sub-items to their parents when the parents are hovered over. If you wish either to collect assignments from the students using the site (about which more later) or to make the site private and thus viewable only by people of your choosing, you’ll need to invite your students to join the site. First, go to Invite New under the Users menu in your dashboard. Next, just paste in the students’ email addresses. They’ll be sent email invitations to join the site, and once they complete the activation process, they’ll be members. If you wish to let the students only read the site, you should invite them as Followers. If you anticipate ever having them contribute to the site, you’ll probably want to add them with the Author role. It would be ill-advised to add them as Administrators or Editors. You can read about the different role options here. Many instructors use WordPress to collect assignments such as weekly reading journals. This is where the Post content type (vs. the Page type we created above) is useful. Posts are differentiated from Pages primarily in that they’re presented in reverse chronological order on a single page, which can be the home page or can be set as an alternate page if you wish to use the home page for other purposes. Students then simply log in and write a new post each time an assignment is due. The instructor can then provide feedback by adding comments to the post. Many instructors encourage students to comment on one another’s posts. You might want to group the posts by assignment for ease of viewing in aggregate. If so, I suggest dictating that the students use Categories that match the assignment name. You could of course also get creative and organize assignments by genre, period, theoretical underpinnings, etc. Grading assignments is, unfortunately, not necessarily a simple matter, as WordPress is a general content management system and not by default an academic system. So if you plan to grade students based on the number and quality of posts and comments they leave, for example, you’ll need to work out a way to track who has actually done the assignments. If you get this far and find WordPress.com to be a reasonable solution to the problem of collecting student work and facilitating student engagement online, you may become inspired to do more with the platform. For various reasons, you’re limited on WordPress.com to the features we provide and can’t augment them by uploading themes or plugins of your own. But there is a downloadable version of WordPress that you can install and customize to your heart’s desire by adding themes and plugins to enhance the look and the functionality of the site. For example, it’s possible that an enterprising developer might one day write a plugin to bring grade book functionality into WordPress. While this would be unlikely to be added to WordPress.com, you could install such a plugin in your own version of WordPress. There are already a few plugins — such as CommentPress, ScholarPress, and Edit Flow — that some educators are using to extend the functionality of default WordPress installs. There are of course some tradeoffs that this increased flexibility brings. You’ll need either to pay for ongoing web hosting or to cajole your IT department into providing space and installing the software for you. And you’ll have the added (fairly minor) burden of keeping the software and plugins up to date so that your site is as safe as possible from being hacked (we take care of this for you on WordPress.com). It’s for these reasons that I suggested at the outset that you first explore WordPress.com, which keeps you from having to worry about these little hassles. If you do decide to take the plunge and install your own WordPress, you can of course export your data from WordPress.com in a format that will import cleanly into a self-hosted install. For more on the distinction between WordPress.com and self-hosted WordPress, see this explanation (or this one, which also lists some suggested hosting partners for self-hosted installs), and if you decide to start out with WordPress.com but are having trouble getting your bearings, try this tutorial. Have you seen http://expecting.coursewa.re/ ? I haven’t! Thanks for the reference. I’ll be curious to see what comes of this. Wordpress is already a good resource for academics, but is true that you need some basic skills to use it like you need. If still target your objective> „ways to address the particular needs of that segment of users, which I take to be composed mostly of professors and graduate students with some publishers mixed in.” please have a look at http://scholar.harvard.edu Is a projects developed on Drupal. coursewa.re is an initiative of Stas which already developed ScholarPress for BuddyPress. I hope this will be full featured.